Sam Neill's screen CV spans 120+ roles, from Kiwi classics to Hollywood blockbusters. His directing credits include short films, the award-nominated Brush Off and co-directing an acclaimed documentary about New Zealand cinema. Away from the camera, says Neill, "I live quietly and pluck my vines". His vineyard Two Paddocks launched in 1993. Sam Neill entered the world as Nigel Neill, in Omagh, Northern Ireland in 1947 (the nickname Sam came into play, after the discovery there were a lot of Nigels at school). His father was a third generation New Zealander serving in the British Army, his mother English. They returned home in 1953 to join the family's wine and spirit merchant business. Growing up in Christchurch, Neill got a near classic English education, attending Anglican boy's secondary school, Christ College. Along with his family background, this likely helped set Neill in the mould of the urbane English gent he has played many times in his career. But growing up in a far-off colony also gave Neill his point of difference — a sense of belonging somewhere ‘else', which comes through strongly in his work. He loved movies, especially Alfred Hitchcock. As well as acting in school productions, Neill took part in the annual Shakespearian productions put on by novelist Ngaio Marsh. Neill's thespian ambitions blossomed while doing a BA in English at Canterbury University. He joined the Players' Drama Quartet, spending a year criss-crossing Aotearoa in a minibus performing Shakespeare (experiences echoed in a film he later directed about theatre troupe Red Mole). Neill joined the government-owned National Film Unit; over the next six years he gained a grounding in all aspects of documentary production. He talks in this video interview about how the unwritten agreement at the time was to make one film for the unit, then one for yourself. He directed roughly nine NFU shorts, some of which screened in cinemas before the main attraction — including Flare: A Ski Trip, and Surf Sail, which followed the first crossing of Cook Strait by windsurfers. He also directed pieces on architect Ian Athfield and telephone etiquette. Alongside acting on stage came the odd screen role. Among the earliest were 1971 teleplay The City of No and goldrush tale Hunt's Duffer. Neill's feature film debut is either Landfall or Sleeping Dogs, depending how one defines it. Landfall (shot in 1975) was begun as a telefilm. Worried about the edginess of some of the material, state TV chose not to screen it; it debuted at the 1977 Wellington Film Festival. Directed by NFU colleague Paul Maunder, the experimental drama followed four people struggling to live an alternate lifestyle. Neill played a man haunted by the Vietnam War. A performance as a priest in Barry Barclay short Ashes (1975) helped win him the leading role in breakthrough New Zealand feature Sleeping Dogs (1977). His performance as a man on the run from a totalitarian Government was perfectly in synch with the material. Local audiences saw an everyman hero to whom they could relate. But more importantly for Neill's later trajectory, international audiences and critics recognised his star quality too. Neill's director and co-star in Sleeping Dogs have each paid tribute to his talents here. A fork in the road came with an offer to star in Gillian Armstrong's My Brilliant Career (1979) — a title that would be prophetic for Neill. The move to Australia saw him take on a variety of roles, including TV show The Sullivans, and it got him noticed. One of those who saw his potential was veteran English actor James Mason. Mason recognised kindred qualities in the young man from downunder. Not only did he recommend Neill for the role of the Anti-Christ in Omen finale The Final Conflict; Mason also bought "an air ticket to Europe and found me an agent". Starring opposite sometime partner Lisa Harrow, Neill's performance was seen by filmmakers beyond the Antipodes. But it was his starring role in hit British TV series, Reilly: Ace Of Spies (1983) that consolidated Neill's reputation, in the process earning him a Golden Globe nomination for Best Actor. Neill has spoken of being obsessed by travel, partly because of New Zealand's isolation. Over the next few years he did arthouse films in Europe, movies in Australia, and TV productions on both sides of the Atlantic. In 1989, he won an Australian Film Institute award for his portrait of Michael Chamberlain — whose child Azaria went missing at Uluru — in Evil Angels (aka A Cry in the Dark). Neill joined Sean Connery in hit The Hunt for Red October, and starred as a deadbeat chef opposite his friend John Clarke in Aussie black comedy Death in Brunswick. In the process he became a dependable, bankable leading man; but Neill's star was set to rise still further in one extraordinary year. In 1993 Neill played one of the scientists in Steven Spielberg blockbuster Jurassic Park, and followed it with a powerful performance as a stuck-in-the-mud colonial in Jane Campion's award-winner The Piano. He described one challenging scene to The Guardian: "..chopping off your wife's finger in a rainstorm in the mud. Could have a bad effect on you." Co-star Holly Hunter "fought back like buggery. After three takes I was absolutely exhausted". Neill has continued to play a wide range of roles across varied genres, exhibiting a consistent ability to woo audiences, whether playing hero, villain, or the wizard Merlin (the Merlin mini-series got him his first Emmy nomination, and third Golden Globe nom). He has worked with directors John Carpenter, Wim Wenders, Claude Chabrol and François Ozon. He has even won the pop culture accolade of guesting on The Simpsons. There have been many roles in Australia, which adopted him as a local: TV's Robbery Under Arms, Dead Calm, Sirens, The Dish, and the "exquisite, sophisticated seediness" of his drug baron in Little Fish. After 14+ years acting outside Aotearoa, he returned for The Sinking of the Rainbow Warrior (playing real life detective Allan Galbraith) and The Piano. Since then he has joined Kiwi director Gaylene Preston to co-star as the charismatic mystery man in genre-twisting thriller Perfect Strangers (2003) — shooting on a "savagely beautiful" corner of the West Coast — and joined director Toa Fraser for award-winner Dean Spanley (2008). He Neill played an unusual priest, opposite the legendary Peter O'Toole. The following year Neill was the mysterious Mr Jones in Jonathan King's retooling of sci-fi classic Under the Mountain (a clip of Neill's performance can be seen here). in 2016 Neill won over a new audience, thanks to Taika Waititi's odd couple comedy Hunt for the Wilderpeople. Neill plays the outwardly grouchy Uncle Hec, on the run in the forest with a supposed delinquent (Julian Dennison). The film became reigning local box office champ; it also won Neill his first NZ Film Award, for Best Supporting Actor. As far back as 2008 Neill had begun turning more of an eye to television, after concluding that the medium was starting to take more risks than film. The first season of hit drama The Tudors involved six months in his birthplace of Northern Ireland. Two award nominations followed. He went on to play cops in three very different TV shows: as boss to Oscar Kightley's detective in gritty local drama Harry: as a 1920s-era Irish detective trying to clean up Birmingham in BAFTA-winning hit Peaky Blinders; and as an ex detective opposite Bryan Brown in Australia's Old School. Neill has returned occasionally to directing. In 2004 he was nominated for an Australian Film Institute directing award for quirky crime thriller The Brush Off. It was also nominated for best telefeature or mini-series. Neill developed the project with his Huntaway Films partner John Clarke. Documentary Cinema of Unease (1995), co-directed by Neill with his ex NFU colleague Judy Rymer, remains a definitive, though contentious, study of New Zealand's "dark and brooding" cinema. Calling it "a highlight" of the international Century of Cinema series, New York Times critic Janet Maslin rated Neill "a first-rate tour guide". In 2012 producer Owen Hughes got in contact about the idea of a documentary looking at Anzac history through the lens of Neill's family (his father, grandfather and great grandfather were all in the military). The result was the acclaimed Anzac: Tides of Blood (Australian title Why Anzac with Sam Neill). The doco explores his family's experiences of WWl, and the legacy of the Anzac story on both sides of the Tasman. 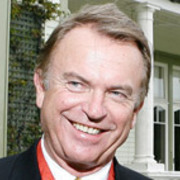 In 2016 Sam Neill won his first (Australian) Logie Award, after starring as real-life mining magnate Lang Hancock in mini-series House of Hancock. He went on to starring roles in mini-series Tutankhamun and Australian movie Sweet Country, directed by Warwick Thornton (Samson and Delilah). Neill is also set to rejoin Sleeping Dogs director Roger Donaldson for The Guinea Pig Club, about pioneering WWll plastic surgeon Archibald McIndoe.